Apparently, not everyone likes zucchini — or more to the point, not everyone likes zucchini after the first serving at dinner or after the first loaf of zucchini bread. Zucchini doesn’t have much staying power with friends, families, or neighbors. You can’t give this stuff away, it seems. 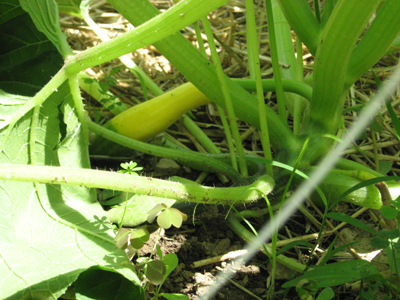 Still, I really love summer squash and zucchini, and so I planted some for myself this year. I reasoned: If the plants really do run wild and produce mountains of fruit, I’ll bring them by the basketful into my office. I successfully shared baskets of cucumbers, tomatoes, and jalapeno peppers last year. So why not squash? Surely my plants will not sate my 50 co-workers. You will see from the Photo of the Day that this variety boasts a green tip at the base. I was also intrigued by the name “zephyr.” I went to Merriam-Webster.com (see “Words from Others”) and learned that this cheerful squash was named for a westerly breeze. I am not sure how that fits this vigorous, sunny grower. I suspect that in a few weeks, “breezy” will be the last adjective I’d apply to this plant. Maybe “typhoon”? A distinctive, slender fruit, yellow with faint white stripes and light green blossom ends. Harvest young at 4-6″ for unusually delicious nutty taste and firm texture. Unique appearance for easy recognition. Big, open plant, high yielding. Packet: 30 seeds. The one at the bottom of the photo is ready for harvest, and the one with the blossom still attached has another day or two to go. Bush Baby’s fruits are true miniatures and ready to harvest at 4-6”. At this stage they are more attractive and “proportional” than full-size zucchinis used as babies. Fruits are glossy and medium dark green with stripes. Semi-open plants are relatively easy to harvest. Avg. 3,700 seeds/lb. Packet: 30 seeds. Again, so far, so good. The catalog speaks the truth. 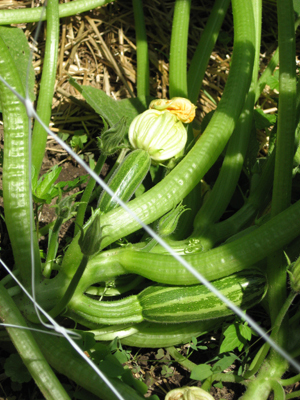 These zucchini are indeed ready to harvest at 4-6″, and they are beautiful. The stripes are elegant, indeed. And how could any parent have too much of a “true baby” anything?! I will let you know. I have 49 days. Oh dear. Well, it’s been nice reading your blog. Hope your will, etc is in order. I only hope the neighbors don’t get swallowed up by the Squash as well. Ha! If you don’t hear from me again in a few days, you will know what happened! But I have a long list of Squash Recipients of which I plan to make very good use! I will survive this lapse in judgment. I love zucchini, goes into soups, stir-fries, lasagnas… The way I see it, if The Husband starts complaining about too much zucchini, he can start making his own dinner! I will GLADLY take some of these off of your hands. Let me know and I can stop by after work some day… I’m working a temp job in Danbury right now and get off at 4:45.
before writing. I have had a tough time clearing my mind in getting my ideas out. My best chance at success is to not even attempt to write unless I am certain I won’t be interrupted for an hour or so. I can’t start and stop. I usually do “housework” to get myself ready to write. I search the internet or my bookshelves for a quote for the “Words From Others” widget. I get my photos lined up, and named so that I can upload them quickly and confidently. By dong these tasks, I’m getting my head ready to write and have been thinking about the topic for awhile without actually writing. Then I write my post in Word first, so that I can easily edit it, correct spelling and grammar, and move things around. I find the WordPress editor a little challenging. After all the housework, I find the words tend to flow more easily. I write as if I were talking to someone I liked. Makes it easier! Good luck to you! If you start a blog, please let me know!